Rawson Marshall Thurber has had tremendous success in comedy. The writer/director is responsible for such hits as Dodgeball: A True Underdog Story, We're the Millers, and Central Intelligence. Thurber tackles big-budget action for the first time in Skyscraper. Dwayne Johnson, his lead in Central Intelligence, stars as Will Sawyer; a former FBI agent turned building inspector who lost a leg in the line of duty. Sawyer is assigned to inspect the Pearl, the world's tallest building in Hong Kong. His family moves into a luxury apartment while he completes the job. Terrorists with an unknown motive attack the building, setting it on fire while pursuing its billionaire owner. Sawyer must rescue his family, fight the bad guys, and escape the burning behemoth. Rawson Marshall Thurber developed Skyscraper during post production for Central Intelligence. The filmmaker was a fan of films like Die Hard and The Towering Inferno, but drew his primary inspiration from Sylvester Stallone's Cliffhanger. As told in our interview, Thurber wanted a story where the hero faced a catastrophic failure in the beginning. Then is forced into action again to save his beloved family. The most interesting aspect of our interview was Thurber's praise of his production team. He was surrounded by Oscar winning, Hollywood veterans behind the camera. Thurber worked with acclaimed cinematographer Robert Elswit (Boogie Nights, There Will Be Blood) and production designer Jim Bissell (ET). Along with the special effects gods at Industrial Light and Magic, Thurber was able to make a harrowing film about a burning building, without a real building or fire. 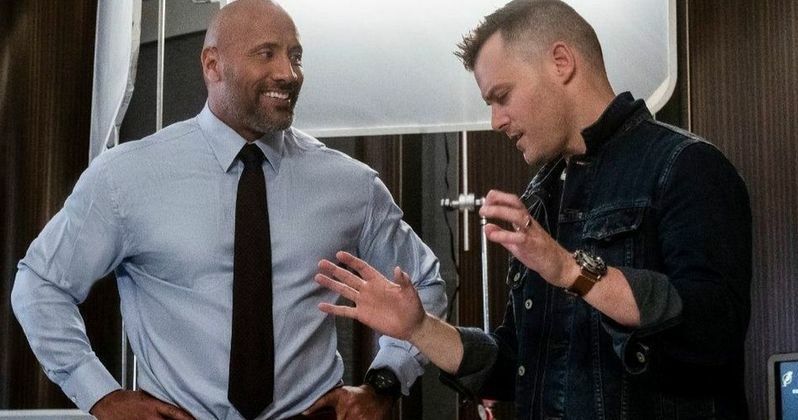 Thurber is already slated to work with Dwayne Johnson for a third time on Red Notice; an international heist adventure about an interpol agent searching for the world's greatest art thief. Red Notice costarring Gal Gadot, will start shooting next May in London, with an expected release date of June 12, 2020. Please see below our complete interview with Rawson Marshall Thurber for Skyscraper, a Universal Pictures film. What was the impetus for this story? The obvious thought for a skyscraper action film is Die Hard and The Towering Inferno. Did those films factor in? Rawson Marshall Thurber: You've got your finger on it. I loved those movies. I am a child of the late eighties and early nineties action. Die Hard, The Towering Inferno, Cliffhanger, The Fugitive, these were films that I deeply loved. Skyscraper is my love letter to those films. It all started on Central Intelligence when I was in post [production]. I wanted to make an action movie since I was eight years old. I went after some Marvel and DC movies. I was always a bridesmaid and never the bride. The primary character of Will Sawyer is so different. He's an amputee. The prosthetic leg becomes a major instrument. It's not quite John McClane's Uzi, but is vital. Where did that idea come from? Rawson Marshall Thurber: First, I'd never seen it done before in a big action film. We've seen Dwayne in action movies before. He's basically invulnerable. He's functionally bulletproof, a superhero without a cape. I wanted to try something else. I wanted to see Dwayne as vulnerable. He wanted to show that side. I wanted to see him struggle to survive, bloodied, battered and bruised; do anything to save the people he loves. The amputee part is critical to that, but it was important to me to not make it an impediment. As you've seen in the film, it doesn't keep him from what he needs to do. In fact, it helps him through many situations. Like you said, John McClane's Uzi, now I have a machine gun, ho ho ho. (laughs) Yes, Will Sawyer is an amputee. But the challenges he faces are not below the knee, but between the ears. Was the film always set in Hong Kong? Or was that done to promote the international box office? Rawson Marshall Thurber: Yes, from the very beginning. Well, originally I had thought of Macau. But when I scouted Macau, it didn't make sense. There's probably only five cities in the world where it makes sense to build the tallest building. Hong Kong is certainly one of them. It is an incredibly vertical city. And, of course, the asian market is growing rapidly. It will soon outpace the US market. It's not by accident that's the setting, but the story points are there. Another element was putting the character in a place where he couldn't speak the language. He's further isolated. The last thing, for a summer action film, we have large sections of the film spoken in Cantonese. I haven't seen that done before. I wanted the film to feel real, in a real place. For all of those reasons, Hong Kong made sense. The production design and visual effects are fantastic. You really sell the vertigo and the fire. Talk about the technical processes that made the film so realistic. Rawson Marshall Thurber: We hired ILM, Industrial Light and Magic. They are the best in the world for a reason. Specifically, we hired the team that worked on Deepwater Horizon. They had a lot of experience creating digital fire on superstructures. The team was led by Craig Hammock at ILM. It was a real challenge making Skyscraper. We're making a movie about a building on fire, but we didn't have a building and didn't have fire. It was completely computer generated. Our production designer, Jim Bissell, a first ballot hall of famer, designed ET and the last two Mission Impossibles. He designed The Pearl. But basically, every exterior shot is designed on a computer. There was fire in the scenes with actors, but that's in the background at a safe distance. A lot of the ember work, and the smoke, and the fire that you see is computer generated. We had Robert Elswit, the greatest living American cinematographer, shoot our film. With his expertise, the interactive lighting, and the wizards at ILM, we were able to create an incredibly photorealistic building and fire. It still surprises me. I'm a stickler for that stuff and I couldn't even tell. What's the best day and worst day filming Skyscraper? Rawson Marshall Thurber: The best day is day one. You finally get to make the movie and stop talking about it. That's always exciting, the first day of school. The worst day is the reviews, when they come out. (laughs) That's never any fun. You make the movie for audiences. That's the least fun for any filmmaker. So negative reviews really affect you? Rawson Marshall Thurber: I wouldn't say really affects me. I don't read them. But, I guess to me, it's never fun to be judged in anything you do, good or bad. You spend so much time making these things. You care so much. You make films for audiences. That's what matter most. Here's a fairly serious question. As a New Yorker, I'm very cognizant of 9/11 imagery, burning buildings, people falling etc. Was that ever a thought or addressed? Rawson Marshall Thurber: Of course, if you're doing a movie about a superstructure on fire, you are haunted by imagery of that tragedy. Every American feels that way in your soul, in your core. We steer pretty clear about hearkening back to that sad day. What we're trying to do is tell a story about a man and a woman keeping their family safe. The building itself is essentially empty. There is no threat to large groups of people. We keep it focused and simple. There's never any danger of the building collapsing. Let's discuss your future. You've worked with Dwayne Johnson on Central Intelligence, this film, and again in the just announced Red Notice, also with Gal Gadot. What can you tell us about that film? Rawson Marshall Thurber: I'm super excited. I just started writing it about two weeks ago. I'm hip deep in it. (laughs) It's an international heist picture, kind of in the vein of Ocean's Eleven, meets True Lies, by way of The Thomas Crown Affair. Dwayne plays an Interpol agent tasked with catching the world's most wanted art thief. Played by an actor yet to be named, I'm pretty excited, but can't say anything yet. Gal Gadot plays a mysterious figure in the art world. I can't wait. It comes out June 12, 2020. We start shooting May first in London. I've interviewed several people who have worked with Dwayne Johnson. He gets such adulation and praise. Why is he so likeable? Rawson Marshall Thurber: I personally don't like him at all. You got to do, what you got to do, to get your movie made. (laughs) Sometimes you got to hire a big, dumb wrestler. (laughs) No, of course I'm kidding. Dwayne is flat out the best collaborator you could ever want. He's incredibly polite, gracious, hard working, humble. He takes the work seriously, but never himself. The thing I love the most, all he cares about is the movie. He doesn't care about him. Does it work for the movie? Is this the best for the movie? I can't tell you what a gift that is as a filmmaker. The biggest star in the world supports the film over his performance. You can't ask for more than that.